Coconut Lentil Paneer Curry with mushrooms - easy and delicious recipe. So, you guys might know that about three years ago now, we asked Melanie Lionello to help us develop a recipe that combines taste and nutritional ingredients. Melanie came up with this brilliant, tasty and satisfying Coconut Lentil Dahl kind of soup. A recipe inspired by her travels in India and her beliefs in the power of Soul Food. The recipe is based on South India’s staple lentil Kootu, which includes both lentils and nutrient-rich mung beans, as well as capsicum and sweet potato to give it a slightly sweet taste that sets off the spices very nicely. Today, we’re sharing a great way to bring some excitement to your traditional mid-week curry. We all know that Melanie can create some delicious, fragrant & surprising dishes. Well, this one is no exception to the rule. 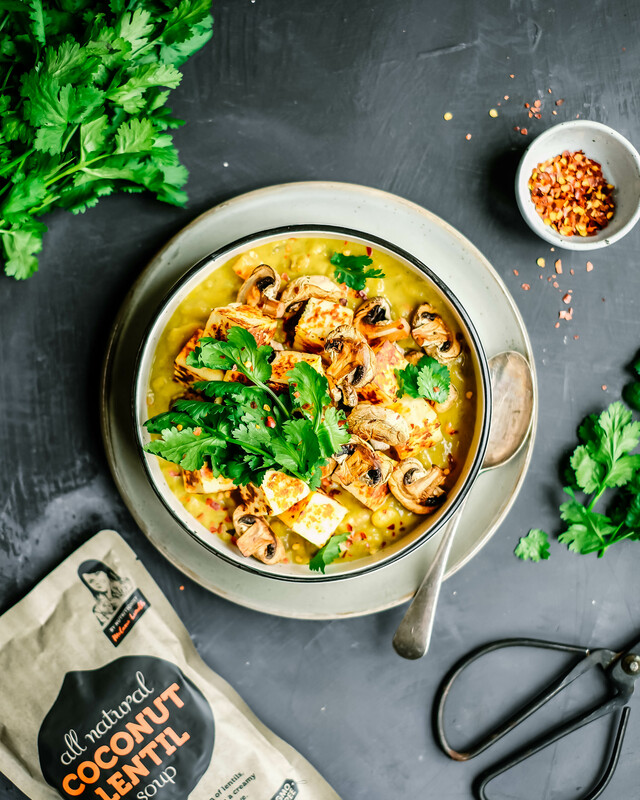 Coconut Lentil dahl + mushroom + paneer? How would that taste? It’s an unusual combo but it’s super delicious and very hard to resist! Lentils based dishes are probably the most versatile and open for experiments. You can make dozens of different things that will always be so different in taste and texture. Paneer is a fresh, unsalted white cheese made out of fresh milk that doesn’t require any ageing or culturing. Because it has a mild, milky flavour and a dense crumbly texture it goes beautifully well with strong spicy flavours. Paneer won’t melt like other cheeses. It is THE perfect addition to any curry. And oh, good news, you can find it in the fridge section of your nearest ‘W’ supermarket! This vegetarian Coconut Lentil paneer curry can be eaten as a side with roti, as an everyday main with rice or even for special occasions! Happy Bellies! There is no doubt you will love this it as much as we do!